Mark Bradford likes to think big. He likes to read big books. He likes to make big art pieces. He has big ideas, and he executes them in a big, big studio in South LA. 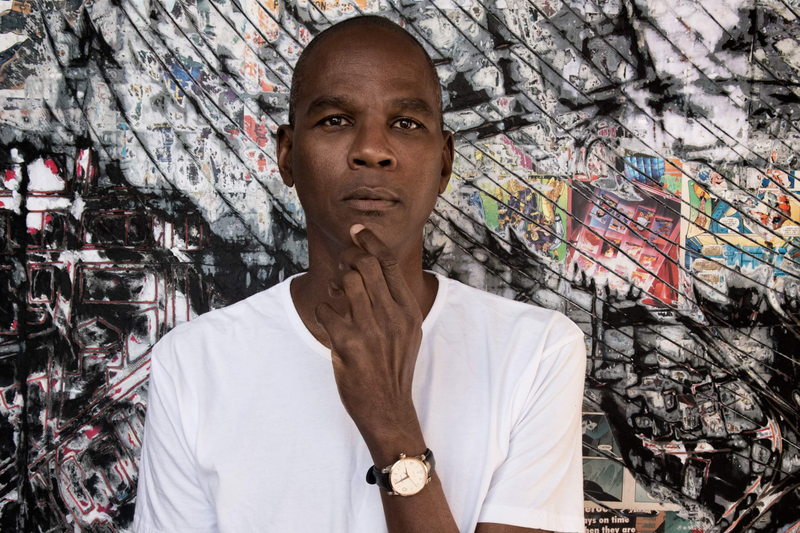 But right now, Mark Bradford is thinking small – as small as a single panel in a comic book. We’re standing in front of a big unfinished painting in a big room of his big studio, which has been made from layering paint and pages torn from comic books, and watching as he purposefully rubs out the distinct figure of a classic comic-book trope, a scantily clad buxom maiden, using the pad of his right thumb. Paper has always formed the base of Bradford’s work, from back when he was straddling the line between artist and full-time hairdresser, tacking stacks of endpapers used for hair perms on to canvas, staining them with hair dye and paint and calling it art. He’s also used billboard papers in the past, but his latest material fascination is with graphic novels. These form the base of the works he’s finishing for two shows in LA and Hong Kong with his gallery, Hauser & Wirth, debuting in February and March respectively. “It’s all about where myth and urban setting meet through superheroes. It’s dystopian – like Gotham, in a weird way. I feel like the world at the moment, it’s just gone so loopy. So why not go to something that is all about that? The graphic novel part is so dramatic and densely saturated with colour, and with mythology. Help us, Superman! And Superman’s always on his way.” He pauses. That said, after switching to continuation school in his junior year of high school and skipping college altogether – though an avid reader since youth, he didn’t care much for the structured environment of school – Bradford spent most of his 20s in between the nightclubs of Europe and the floor of his mother’s salon, having joined the family coif-and-cut business. He was gay and it was the ’80s, a great and scary time, when the reality and consequences of Aids loomed large but the disco scene was too good to turn down. Lucky for him, the partying got old – or he got a bit old for the parties – and somehow, he found himself applying for a programme at California Institute of the Arts, America’s very first degree institution created specifically for visual and performing arts. He was 30. He learned a lot of theory at CalArts, and he even continued through to a graduate programme. Afterwards, he found himself back at the salon. It wasn’t so different, he argues, from what he was doing at university. With fire, and with colour. Bradford started taking boxes of endpapers home from the salon, where he would torch the edges to form patterns and then dip them in hair dye and paint mixed wrong at Home Depot that had made its way into the discount bin. All these materials would find their way on to canvases forged of bedsheets, becoming tremendous, grid-like pieces that resembled aerial maps. Over the years, his practice would evolve to include the use of merchant posters advertising local businesses and stencilled letters and other tropes, but paper – the kind that’s found, not created, that has had a function in society – has remained central. Holding his hand for the ride is his partner of 20-plus years, Allan DiCastro, with whom he founded Art + Practice, which offers support services to foster youth in South Los Angeles and access to free, museum-quality art exhibitions and art lectures. Bradford has taken his social consciousness with him overseas, too. Last year, he represented the US at the Venice Biennale, at the same time inaugurating a six-year project with Rio Terà dei Pensieri, a facility that provides employment to prisoners, to open a shop selling handmade wares created from found materials, a practice with which Bradford certainly has experience. But while some artists choose to weave social aspects directly into their tapestries, Bradford is conscious of keeping things together, but separate. In this case, the art is most definitely separate, in tone and execution, if not in message – Bradford has called his Venice piece an ode to those who live at the periphery. His Venice exhibition was titled Tomorrow is Another Day, and let’s hope it is: in the first gallery room hung Spoiled Foot, a sculpture that dipped from the ceiling reaching almost the floor like an oppressive plague, blistered and invasive, a pockmarked monster in black, red and urgent neon orange, forcing viewers literally to scatter to the fringes of the room. This is clearly the intention of the 203cm-tall artist, who has spent most of his life conscious of the heights of doorways and ceilings. In another area, a high-ceilinged rotunda, rope-like structures circle the inner dome and reach down along walls like your worst nightmare in a horror movie. But the exhibition ends with hope: smaller (well, smaller for Bradford) paintings hang in a subsequent room, where neutral hues dominate, and the final piece is a video work in which a friend of the artist’s marches exuberantly down the street, seemingly walking in place at times, with the film ending before he reaches the end of the street. It’s slow going, but it’s going. Equally large in scale, and heavy in intention, is Pickett’s Charge, a cyclorama that’s being shown at the Hirshhorn Museum & Sculpture Garden in Washington DC. To create this monumental piece, Bradford took reproductions of Paul Philippoteaux’s Battle of Gettysburg painting depicting the final game-changing turn of tides at Gettysburg, interspersing it with coloured paper and scoring through the layers of paper to achieve eight panels more than 3.5 metres high and almost 14 metres long. Bradford is happy to talk about his work – “I want all my interviews to be living” – and passionate about them during execution, but he’s known to liken finished works to relationships that have ended, whether it’s an emotionally draining and monumental site-specific like Pickett’s Charge, or a simple 10-frame hang at a local branch of Hauser & Wirth, which has been his representation for the last half a decade. More than a dozen paintings hang in his studio, destined for one of two Hauser & Wirth shows in the offing: an LA one that opened last month and this month’s launch exhibition in Hong Kong as the gallery debuts its space at art hub H Queen’s. Bradford was an easy and intuitive choice for the splashy launch, timed to coincide with Art Basel: “Mark is particularly close with each of the gallery’s three partners – myself, Manuela and Marc Payot,” says Iwan Wirth, who along with wife Manuela Wirth now runs the gallery known for its family-style approach and legendary intimate soirées – and for never having lost an artist to a competitor. And Bradford really is a gallerist’s dream: a critically acclaimed commercial juggernaut with a heart of gold who’s also a dinner-party hit. “There’s an insatiable appetite for Mark Bradford’s work because it speaks to people on many different levels,” Wirth explains. “Firstly, it’s socially engaged, and Mark brings to light complex concepts with great clarity. But his true gift is that he does so through an incredible command of materials; his paintings stand as fine examples of accomplished craftsmanship. It isn’t just the Wirth clan that enjoys these privileges. In the centre corridor of the studio, Bradford’s grown-up godson is varnishing a painting that lies on a table as Bradford pulls him into an affectionate neck grip. “He’s shy,” he says. “He’s been here two days.” Others have been here longer, like Diego Lopez, an assistant Bradford has known since he was 11, and on whose opinion Bradford has come to depend – because even one of America’s top artists gets a little uncertain sometimes.